The league’s own press materials refer to him as “the dean of NFL officials.” Referee Walt Coleman will take the field for his 30th NFL season when he blows the whistle to start Thursday’s Hall of Fame Game in Canton, Ohio. In doing so, he will have reached a milestone few before him have achieved. Coleman will be only the seventh official in the NFL’s 99-year history to have worked 30 years in the NFL. Coleman started in the NFL as a line judge in 1989, hired by the venerable head of officiating Art McNally when some of the current NFL officials were in their preteen years. His first regular season game was as a member of referee Jerry Seeman’s crew at Soldier Field in Chicago, where Mike Tomczak was the quarterback for the Bears, and Boomer Esiason started for the Bengals. Coleman was promoted to referee in 1995 when the league expanded to 30 teams. Perhaps the two most recognized incidents in Coleman’s career were examples of bad rules that were officiated correctly. In the 2001 AFC Divisional Playoffs — the Tuck Rule Game — Coleman reversed what would likely have been a game-sealing fumble recovery by the Raiders to an incomplete pass by the Patriots, at the foundation of the New England dynasty. He has not officiated a Raiders game in the 245 games he has worked since. Replay was once again a factor on Thanksgiving Day in 2012, when Lions coach Jim Schwartz threw a challenge flag on a Texans touchdown run. Despite the fact that running back Justin Forsett was clearly down by contact, replay was frozen out under the rules of the time because of the improper challenge. While the incorrect call was made by the covering officials, Coleman, by that since-repealed rule, was correct that he unable to fix it in replay. Among active officials, line judge Jeff Bergman is closest to Coleman in seniority, following the retirement of referee Ed Hochuli. Bergman began 2 years after Coleman, took a leave of absence in 1997, and officially starts his 27th season this year. Coleman’s son, Walt IV, joined the league in 2015. For 30 years, Coleman has been that lunchpail official who economizes his words on the microphone. And it seems that at the age of 66, he is not showing any signs of slowing down. Compiling the list of officials that have worked for 30 seasons was a little more work than expected. With the materials from the Pro Football Researchers Association and with assistance of our partner website Quirky Research, we believe we have the comprehensive list. The undisputed record holder for tenure was head linesman Dan Tehan, who worked in the thirties, forties, fifties, and sixties. After he died in 1980, McNally stated rather definitively, “He was an official for us from 1930 to 1964 — 35 seasons — and no one ever officiated longer.” Coming from McNally, I would treat this as the word of God. Looking back through old boxscores, Tehan was an official of professional football in the Ohio League as well, but he started in the NFL in 1933, making the confirmed record 32 seasons. Tehan also claimed he had 35 NFL seasons; this does not appear to be deliberately conflated, as officials were not technically league employees until the late 1930s. Many officials view back judge Stan Javie, who took the field from the early 1950s to 1980, as “the best official ever,” citing his rule book knowledge and his ability to read plays quickly. In the book The Third Team, retired referee Bob McElwee said he drove from his New Jersey home to Javie’s Philadelphia home weekly for a rules study. He said Javie gave him homework to do for the next study session and was a tough taskmaster. But, McElwee said Javie was also an excellent teacher. Umpire Lou Palazzi, in his 30-year tenure, was renowned for his hustle in getting the ball ready for the next play along with his good judgement. He knew the game well and was a center for the New York Giants from 1946-47. That experience helped him move up quickly in the officiating ranks as he was able to read line play. 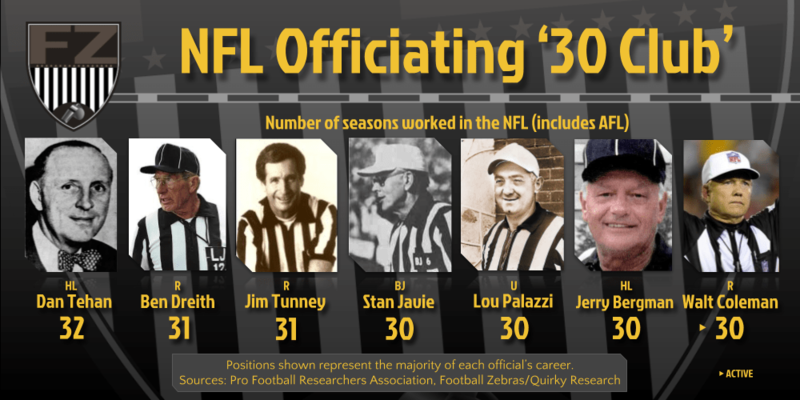 Palazzi helped break in Tunney as referee, a fellow “30 Club” member. Palazzi and Tunney worked together for three years in the late 1960s. Head linesman Jerry Bergman, father of Jeff (the second-longest serving active official), also accrued 30 seasons. Combined with Jerry Jr., currently a line judge, the Bergman officiating tree has a total of 74 collective seasons. A few that did not make the list: side judge Dean Look was assigned to start his 30th season, but triple-bypass heart surgery forced him into retirement right before the season started. There were also some officials that worked NFL games in the 1920s, finishing up in the 1950s, but worked exclusively for some seasons in the vastly more popular college circuit in the 1930s. Of this group of 7 officials, all worked multiple Super Bowls or the pre-Super Bowl league championship games, with one exception. Curiously, Coleman has never worked a Super Bowl in his career, although assigned to a pair of conference championships, with no apparent reason for being excluded. *includes NFL Championship games from 1933-65, AFL Championship games 1960-65, and only Super Bowls 1966-present. Positions and numbers shown are those that represent the majority of each official’s career. Sources: Pro Football Researchers Association, Football Zebras/Quirky Research. Another football zebras screw up. Dean Look DID WORK the 2001 season. He was part of the Tuck Rule game that Walt Coleman reffed. Too bad this site makes more and more errors on stories. We put a lot of effort in over several days trying to ascertain information that is not compiled anywhere. We had information conflicts such as this to research, and worked much harder than you did with the drive-by snark you decided to dump in the comments. So it is not “Another Football Zebras screw-up.” But, feel free to point out where we make “more and more errors on stories.” I will wait.